Delivery Quote Compare > Courier > Couriers and Parcel delivery services, what’s the difference? 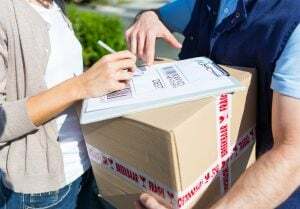 Couriers and Parcel delivery services, what’s the difference? We often hear people commenting or complaining about parcel delivery. While some of this may have good reasons, it could also be due to a commonly confused fact. A lot of people think that a courier service is the same as a parcel delivery service. This isn’t true. A courier service is a dedicated delivery service. They will take your item or items from start to finish directly, with same day delivery a possibility. A parcel delivery service will collect your item and take it to a central hub and sorted. It will then be loaded up again and then delivered. It seems like a quite simple difference; however the parcel service has a lot more logistics involved in the delivery. It is also cheaper than courier services and is perfect for sellers on eBay. The quicker a company can establish where your parcel needs to go the easier it can be to deliver it. A proper label, with a bright contrast from the parcel itself with visible lettering is the best option. If you don’t do this the parcel can be filed under ‘decipher later’ which will delay your delivery. A postcode is a very simple way to work out which part of the country your parcel is being delivered to. It’s way simpler than the address and town names by themselves. There can be up to 12 different people handling your parcel over its journey. That’s a lot of chances where your item can be damaged. Therefore it’s super important to pack with protection in mind. Getting the bubble wrap and sturdy boxes out and double wrapping is the best way to protect your delivery. Most companies who do parcel delivery will be insured. But for some items you might have to pay a few pounds more to get a comprehensive cover. This means that should the worst happen you won’t be left with the bill. Parcel delivery is a fast, low cost option for transporting. However, it’s not great for everything, delicate pieces of glass or pottery being examples. Anything that is very valuable, fragile or expensive may deserve a dedicated courier service. It will cost you more but your item will be handled by only one courier, delivered from one door to the next with no depots. This means that there’s a much lower chance of damage, however you should still be vigilant with the packing and insurance. What’s the difference between a courier and a parcel delivery service? Parcel Companies or Royal Mail?